From providing translations for residents dealing with city agencies, to a bill that would require pharmacies to provide prescription information in languages spoken in every city community, there's a growing movement spearheaded by the Bloomberg administration and some City Council members to dramatically widen the requirements for translation services. Advocates of the legislation, many of whom have been fighting for years to get the city and state to be more inclusive for people with limited English proficiency (LEPs), say the requirements are essential in removing a fundamental barrier to citizenship. Rite Aid Pharmacy, in conjunction with leading language service provider Language Line Services, [promotes a] new multilingual program throughout New York State and launch the roll-out of a language access program in its pharmacies nationwide. With Rite Aid’s multilingual program, customers with limited-English speaking skills may receive certain prescription and other related information printed in any one of 11 different languages and have access to interpreters in more than 175 languages via the Language Line® Interpretation Service. A good move on Rite Aid's part, and a needed one for so many immigrants with limited (or non-existant) English skills. If so, that's good news, and the new service should prove very useful to many people. Yeah, sure they have good interpreters. One of my fellow KSU grads used to work there. However, Language Line only pays something like $8 or $9 an hour. Well, if Language Line pays their interpreters only $8-$9, then obviously the quality cannot be good: no professional interpreter would work for such rates. I wonder, however, what they pay their staff interpreters. Interesting. We've long been strong advocates of equal acccess to health care for all, especially Spanish-speaking customers in pharmacies, who are oftentimes overwhelmed with information in a language they don't understand. Several other states are starting legislation and sponsoring bills in this area (requiring multilingual information, both written and spoken), which is great. We talked to a friend of ours who is an executive at a large specialty pharmacy, and we were happy to hear that they software the use to print out information about the prescriptions is already multilingual, so that's a good start. Now we just have to have a look at the translations to see if they are good -- we hope they are. 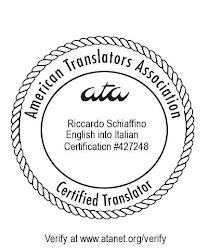 Agreed with Riccardo -- hard to believe that professional interpreters would work for that low a wage. langauge line had recently cut down rates for telephone interpreters as of 1st august 2009 but the bosses are getting more , who sit in the office and do nothing. many interpreters are boycotting language line now. I have a friend from Puerto Rico that has graduate studies and she only earns $7.50/hour and on a typical day spends no less than 350 min on the phone answering all kinds of phone calls, from 911 to Domestic Violence Hotline, etc. The only good thing is that she can work from home.